The blog Miscellaneous Mum, created by Karen Andrews, is one of my favourites. It manages to encompass the detailed trials and tribulations of daily life with a family, great reviews of books (including Stasiland by Anna Funder, interviewed here) and news of her life as a writer. She even started the ‘1001 Books to Read Before You Die’ challenge. (The weird thing is, I started this in a blog, too, many moons ago — before I saw hers. I got about five books in. It was so long ago I can’t even find my own blog using Google. Ah well). She’s doing better. She also somehow manages to hold down a desk job (a great one!) as program manager of the Emerging Writers’ Festival that begins in a couple of weeks in Melbourne. Her blog’s subheading — ‘Trying to find the objective correlative, everyday’ — has kept me thinking for months. It seems exactly the right phrase to describe her type of writing. While many mother-bloggers keep their posts raw and emotional (which I enjoy too), Andrews’ style has an austerity and sophistication that suspends and transfixes you. Chekhov, also a playwright, was a master at using objective external details, coupled with understatement and irony, to convey complex emotional states. This rendering of the internal through the external, the subjective through the objective, is a technique T.S. Eliot later described as the ‘objective correlative’. The method involves writing imagery and actions that are so precise, so resonant, that the narrator doesn’t need to state how a certain character feels: the emotions are already there, embedded in the landscape, the light, the weather, the scents, the sounds, and the silences. To do this, everyday? I spoke to Karen about the challenges of blogging and balancing the writing with family life. When did you start blogging? Was it before or after you had children? KA: I started blogging in August 2006, when my second (and youngest) child was five months’ old. What set you going on sharing your thoughts with the world? KA: I primarily just wanted to get my own writerly ‘voice’ back, as well as my own ‘personal’ one. I had been experiencing severe post-partum anxiety attacks and was just trying to sort myself out mentally and emotionally. Perhaps an odd choice of forum, given the public nature of blogging, but I also wanted to seek out others who’d been through the same, or even help others in their journey. How do you find time to blog around bringing up children? Do you plan it carefully? Or does it happen in bursts of creativity when you get the time? 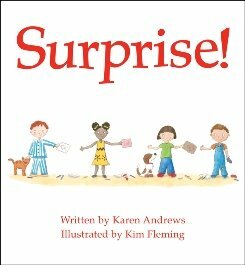 Karen Andrews has also written a children’s book, Surprise! KA: It happens both ways. When the kids were younger, I admit it was more in bursts, while they played near me or during nap times. These days it’s more strategic and regimented as I’ve got other commitments (such as work and my offline writing) to attend to as well. I’ve never worked very well at night — either with writing or blogging — so I really have to manage my time during the day as best as I can. I concede this probably makes me a slower writer, but I’m saner too! Do you think about your writing style much? Your voice? How do you stand out from the crowd? KA: I have been wondering more and more about my writing style in recent times. In my work (program manager at the Emerging Writers’ Festival) I come across different writers and forms all the time, and I do occasionally think, ‘Where do I fit in among the ‘scene’? I still feel young, too, in a career and chronological sense (I’m 33). There’s a tension within me that I’ve always fought: that being the need to rush and the mentality to absorb and learn from others. In terms of standing out from the crowd, I think I have etched out for myself a sort of blogging reputation that coincides with an indie-publishing-slash-entrepreneurial-bent that is nice if — at times — undeserved! I do earn money from blogging, more than writing. That is nice, I admit, but I do remain mindful of my deep set loves and values about writing and keeping a sort of…purity of intent. At what point did you decide to blog about your children? Has there been a topic where you’ve thought, ‘no I can’t go there’? Where do you draw the line on the public/private? KA: I’ve blogged about kids since the beginning; my first post was about my daughter. It was a blog about them — although I knew it couldn’t be forever — and I’ve been slowly turning it into a blog that’s more about me, and they’re more of a reflection in that sense (although I’d never for a moment presume to say that what has happened in the past is an explicit recount but, rather, more of a subjective interpretation rendered in as nice/expressive way as I can, like other creative nonfiction does). There are lines I’ve drawn, but that has been at the request of my husband. The kids will do the same all in good time too. I respect that. Other truths can wait for my fiction. Who is your favourite mother-blogger? What kind of blog writing gets you excited? KA: I have lots of favourite bloggers who are mothers who happen to blog about parenting: I think Penni Russon (eglantine’s cake) is wonderful, and I am proud to call her a friend of mine. We’ve talked about blogging a lot together. Another friend who is an excellent writer is Tiffany Tregenza (My Three Ring Circus). These are in Australia. In America, possibly my favourite is Amy Storch (Amalah). How has your blog influenced your other writing, your novels, your nonfiction, your poetry? KA: It’s made me more open to the value of flash/shorter fiction for starters! It’s made me realise much quicker the greater potential an idea might lend itself to having, ie whether it would be better to make a blog post out of something or turn it into a poem. For example, a day I had at the park years ago could’ve been easy to turn into a post along the lines of ‘We Had A Crap Day At The Park – Let Me Whine About It To You’. But I knew there was more to it than that. So I turned it into a poem — and it went on to win a literary award. This interview is part of the ‘Writing Mothers’ series. If you enjoyed this post, you might also like to read my interviews with Anna Funder, Fiona McGregor and Bianca Wordley (Big Words blog).